Discussion in 'Online Games - News and Reviews' started by Marina, May 2, 2014. Are you ready for a trek into the jungle? We surely hope so as Mazooma Games has brought an exilhirating online slot to the Novomatic Group. Rumble In The Jungle will just blow you away. can accumulate fantastic winnings. What awaits you in the jungle? Will you see and hear the monkey ready to give you great winnings or a surprise bonus? The soothing sounds of the parrots may fly across your path to bring you a nice bonus. This is one incredible online video slot that will have you spinning away. 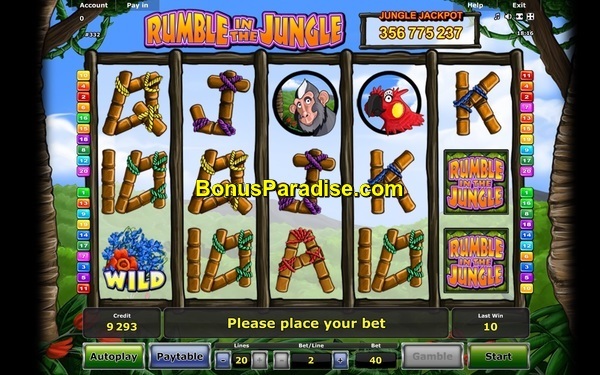 Rumble In The Jungle is a 20 payline, 5 reel, 3 row videoslot online. The game interface is quite easy for the player to navigate. and there is a gamble button that you may choose when you have a winning combination. By chosen the gamble button, you can double your current win as many times as you want. Should you bust, then you loose all. Players can also choose the number of lines played and the size of their bet by utilizing the + and - buttons. splat a banana upon the screen to give you a random win of cash or even a chance at a bonus round which will give you a chance to win the Jungle Jackpot. You can also receive a "rewind" reel during regular play. One reel will rewind and give you a chance of completing a winning payline. All wins pay left to right except the 3 Bonus Round symbols which are the Monkey, the Parrot and the Jungle Spin symbol. The Wild symbol substitutes for all except for the three bonus round symbols of the Monkey, Parrot and Jungle Spin symbol. Besides the surprises of the Monkey and more, you can look forward to 3 incredible bonus rounds to rack up your winnings and get the chance at the Jungle Jackpot. Jungle Spins icon only appears on reels 2, 3 and 4. When you land all three on those reels, you will be rewarded with 5 free spins. During the free spins of the Jungle Spins bonus, landing 5 gold bananas in a winning payline will award you with the Jungle Jackpot. Another incredible feature is the Monkey Bonus. Receive 3 or more Monkey's anywhere on the reels and you will be trekking through the jungle to some nice wins. to match the row it was on. Players will accumulate multipliers for every matching combination. You can also win the Jungle Jackpot for matching bananas to complete the sequence. The spins will continue until the 3 rotten banana sequence is filled. Once the rotten banana line is complete, the Monkey bonus is over. You have the chance to win over 500x's the bet. It's an incredible bonus round. beautiful parrots will fly onto your screen amongst an amazing jungle scenery. The player then will Pick a Parrot and will reveal a prize amount. It could be something great or something so, so. No matter what, it's still a nice bonus. The best winnings for Rumble In The Jungle are the Bonus Features. Remember, the higher your bet, the bigger the winnings. Come take your jungle trek at Stargames and see what Rumble In The Jungle has in store for you. This may end up being one of your favorite online video slots. Get ready for one of the most exciting video slots!! This game is awesome. Bonus rounds hit all the time! Can't wait for it to go live. Rumble in the Jungle Online Slot launched today at Stargames! I have been playing this slot yesterday. Really nice slot to play. It is hard to get the free rounds but the monkey jackpot game is really great. I had a few times 50x in the bonus round.